A lovely ground floor apartment of 88 m2, which is part of the maritime and artistic environment at the port of Nykoebing. There are views of Nykøbing Fjord. As the closest neighbor to the harbor is the beech forest and the cozy Anneberg Park. The apartment is from 2004 is for 4 people, sleeping accommodation is divided into 2 bedrooms with double bed (mattresses). The apartment has 2 toilets, the kitchen / living room there is access to the open terrace (20kvm) and beautiful views of the fjord. From both bedrooms you have access to an enclosed courtyard terrace (35kvm). In the bedrooms are carpeted, while in the entrance hall, kitchen, living room, bathroom and guest bathroom is tiled with underfloor heating. The apartment is tasteful and cozy furnishings and appear everywhere very well maintained. The apartment is located 500 meters from the center of town. Nykoebing is a nice town with good shopping and specialty shops. On the other side of the city are some of Sealand's best beaches - North Beach and Rørvig Strand. Take the bikes and enjoy the beautiful scenery along the paths f. Ex. 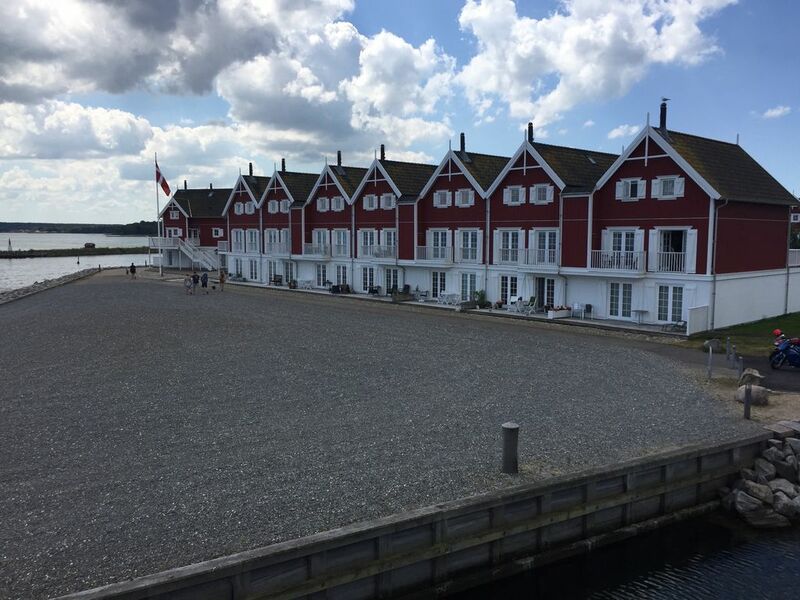 From Nykøbing Harbour to the harbor in Rørvig. Here both experienced bird sanctuary and beautiful vantage points along the way. Top-Wohnung mit überdurchschnittlicher Ausstattung! Die Bilder entsprechen der Realität, wir haben uns sehr wohl gefühlt. Smagfuld indretning og med rigtig fint udstyr. Dejlig lejlighed i område med mange fastboende, men også mange turister. Gode muligheder for rigtig mange friluftsaktiviteter, og Kbh. ligger kun en time væk i bil. Eine Woche lang haben wir uns in dieser schönen Wohnung erholen dürfen. Sie ist modern eingerichtet und es fehlte an nichts. Immer wieder haben wir die schöne Aussicht auf das Wasser genossen. Wir haben viele Ausflüge unternommen mit dem Auto(z.B. nach Kalundborg und Roskilde) aber auch mit dem Fahrrad ins nahegelegene Vogelschutzgebiet oder an den Kattegat. Wir werden diese Wohnung an Freunde weiterempfehlen. Mietbeginn: Samstag 15.00 Uhr Mietende: Samstag 10.00 Uhr Strom 2,50 Kronen pro. KWh. Wasse 150 dkr. pro Woche Endreinigung kann vorbestellt werden: 750 dkr. Stornogebühr 68 € Bezahlung: Innerhalb von 3 Tagen sind 25% Anzahlung zu überweisen. Den Restbetrag + die Kaution in Höhe von 101 € sind spätestens 6 Wochen vor Reiseantritt zu zahlen.